We have two mountain homes located just off the Blue Ridge Parkway near Meadows of Dan, VA and a beach condo at Cherry Grove, SC. All of these properties are available for rent year-round. Our mountain resorts are just about a two hour drive from Greensboro, NC and are located on a 100 acre tract of land adjoining the beautiful Blue Ridge Parkway. The land also adjoins a 5,000 acre tract of land on two sides, which is owned by the U.S. Park Service, and borders Villa Appalaccia winery on the remaining side. There are excellent hiking trails nearby, several good restaurants, a golf course, and two wineries in the general area. The beautiful property is also home to special events such as FloydFest (www.floydfest.com) and FloydFandango Beer and Wine Festival (www.floydfandango.com). 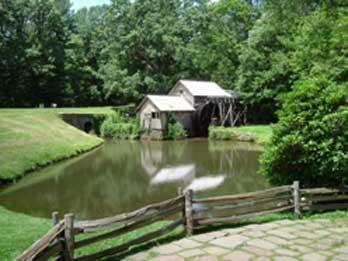 Mabry Mill, one of the most photographed attractions on the Parkway, is only 6 miles away. Our beach resort property is located at Inlet Point Villas in gorgeous Cherry Grove, SC. The condo is a second-floor unit of a three-floor building that is approximately 100 yards away from the ocean. You may walk to and from the beach without crossing a street. There is also a swimming pool, two tennis courts, and a basketball goal in a private, gated area available at your leisure. Lots of excellent restaurants, several grocery stores, and many vendor stores are nearby. There are also a variety of movie theatres within approximately 10 miles of our location. Sorry, but we DO NOT allow pets in our vacation rental properties.